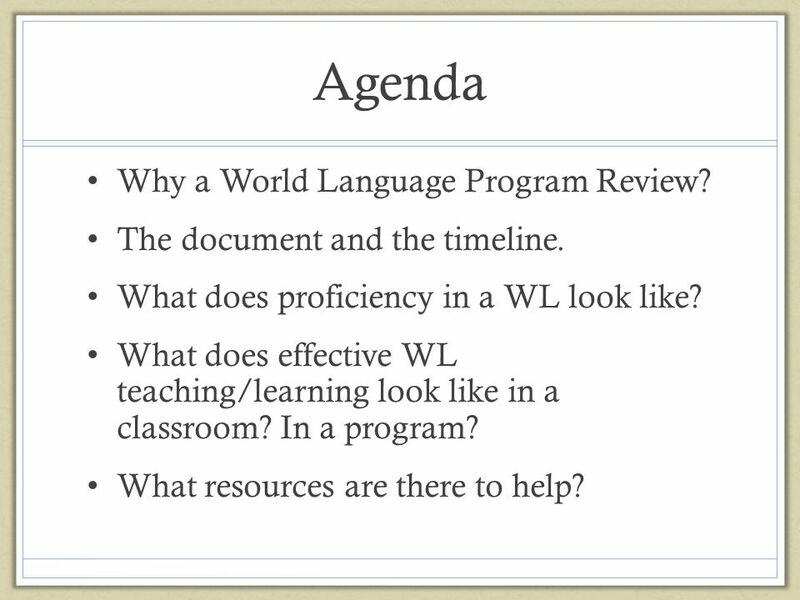 2 Agenda Why a World Language Program Review? The document and the timeline. 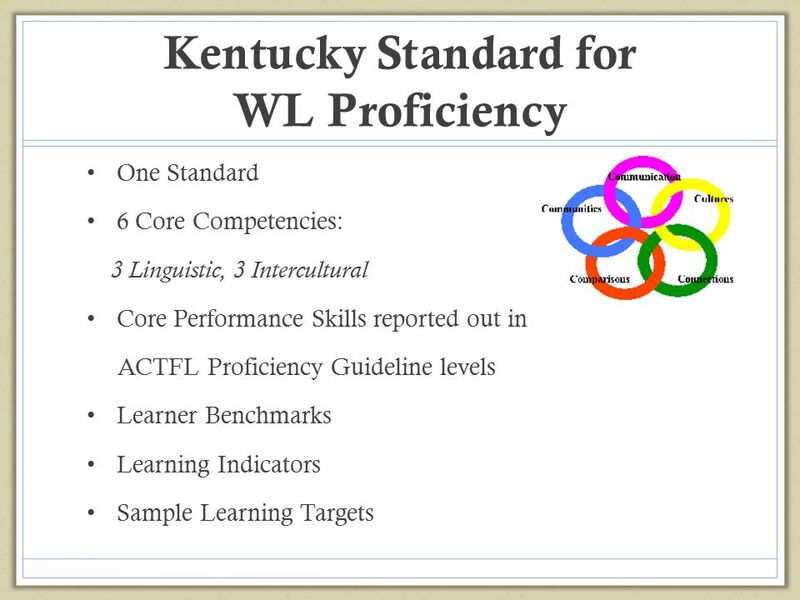 What does proficiency in a WL look like? 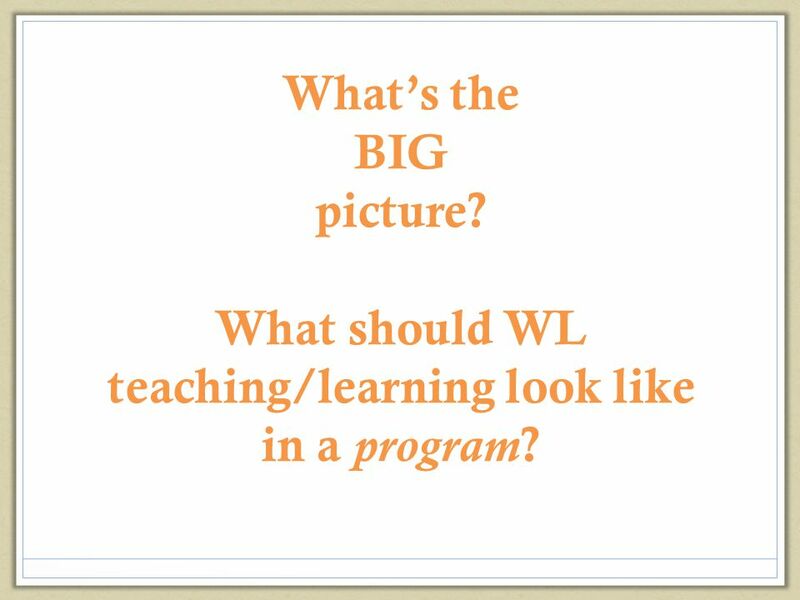 What does effective WL teaching/learning look like in a classroom? In a program? 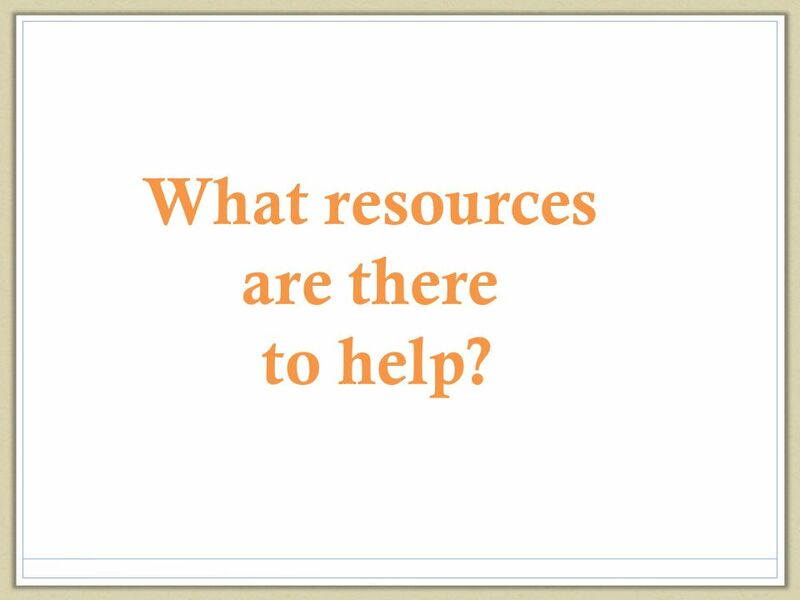 What resources are there to help? To improve vocabulary To learn your own language better (grammar) For travel abroad To learn geography To enrich knowledge of culture To get into college To appreciate int’l lit, music, art, film To improve communicative and cultural competencies To speak to our neighbor & co-worker To improve employment potential and advancement; to compete for hire To prepare for the military; National Security and International Diplomacy To build literacy & sharpen cognitive skills To meet college admission requirements Because learning a language involves a variety of learning skills, studying a foreign language can enhance one's ability to learn and function in several other areas. 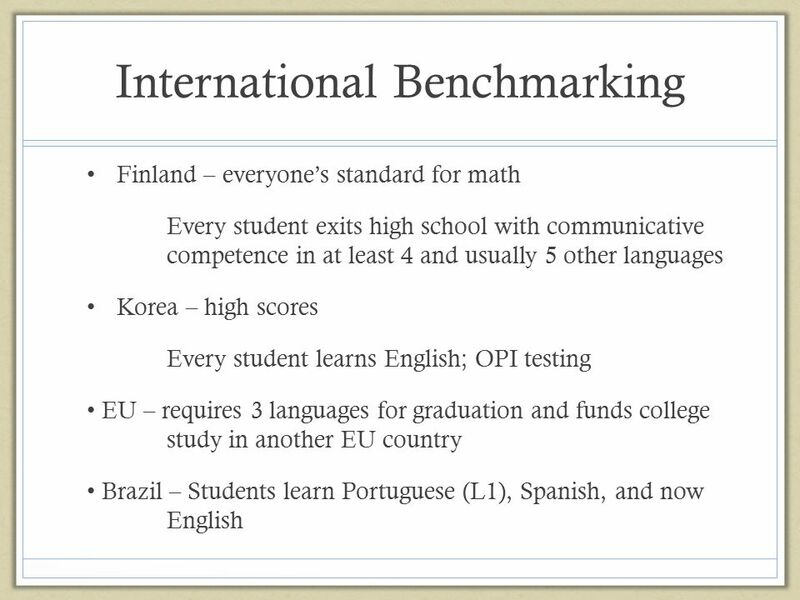 Children who have studied a language at the elementary level score higher on tests in reading, language arts, and math. 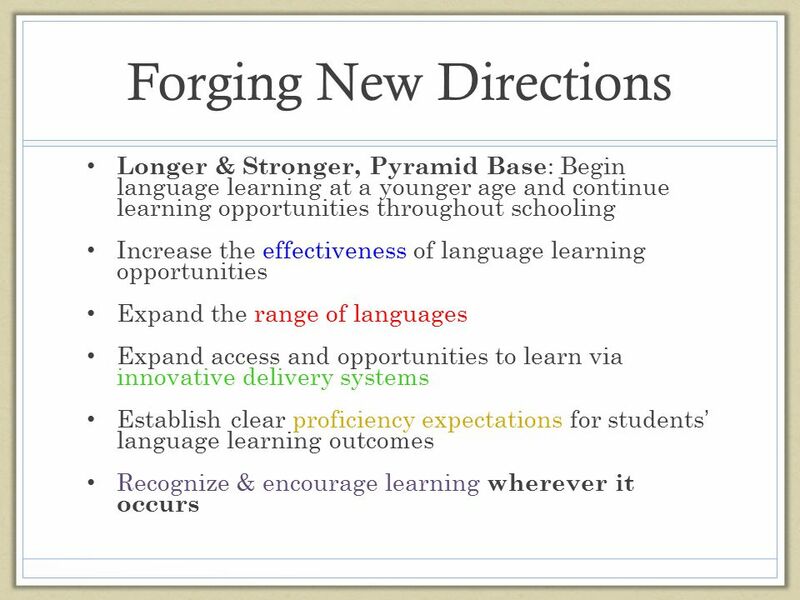 People who have learned foreign languages show greater cognitive development in areas such as mental flexibility, creativity, and higher order thinking skills, such as problem-solving, conceptualizing, and reasoning. 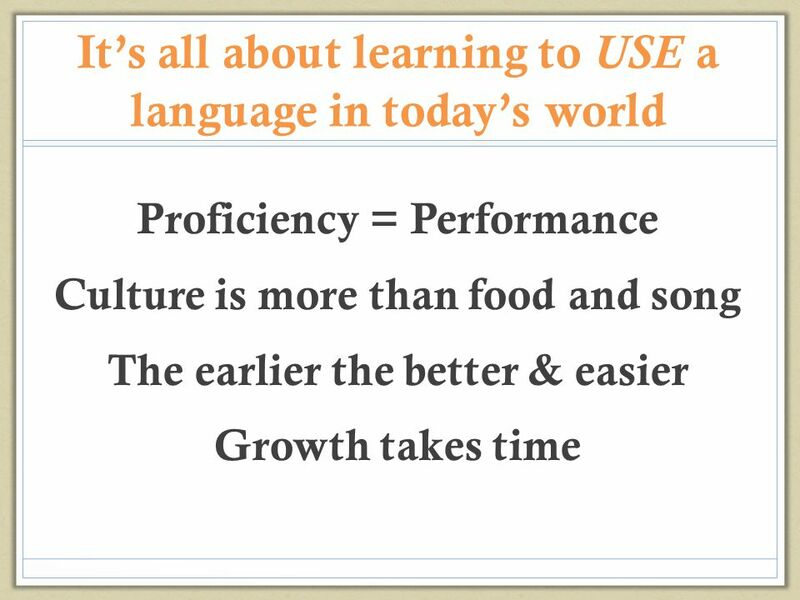 In addition to cognitive benefits, the study of foreign languages leads to the acquisition of some important life skills. Because language learners learn to deal with unfamiliar cultural ideas, they are much better equipped to adapt and cope in a fast-changing world. They also learn to effectively handle new situations. In addition, the encounter with cultures different from one's own leads to tolerance of diverse lifestyles and customs. 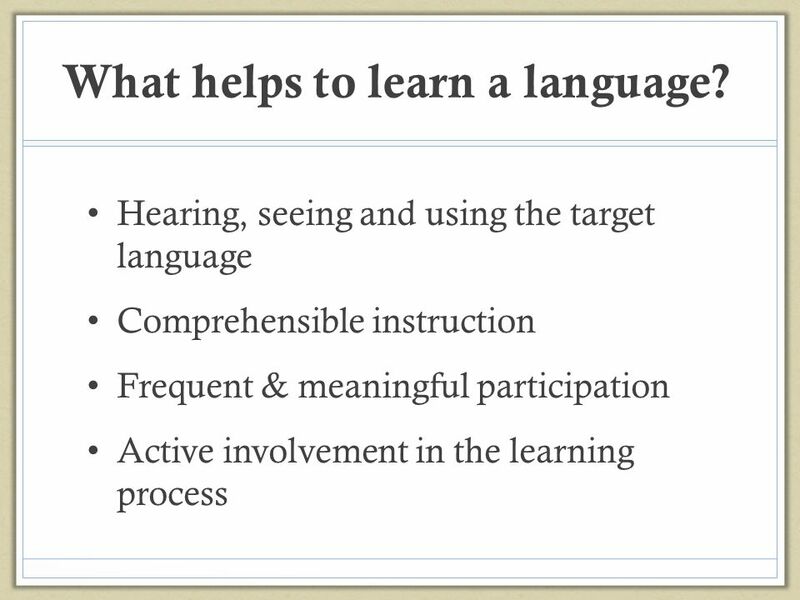 And it improves the learner's ability to understand and communicate with people from different walks of life. 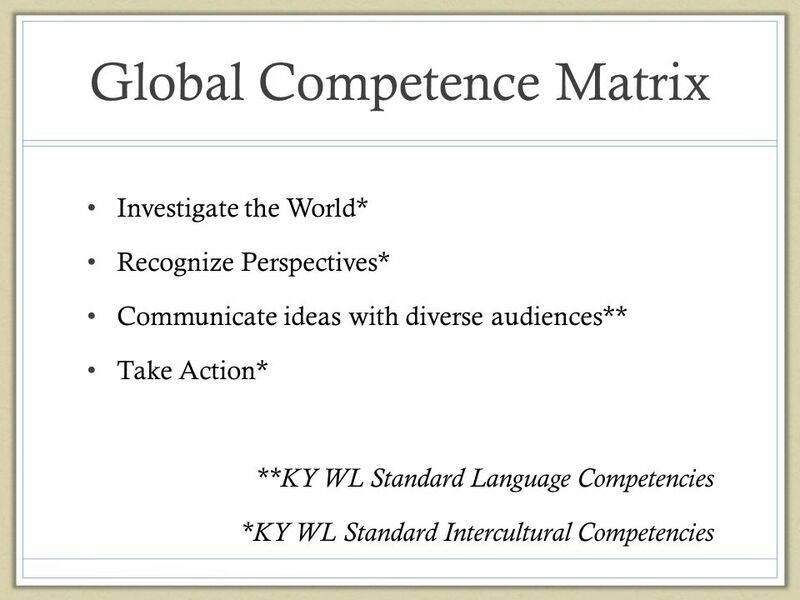 Investigate the World* Recognize Perspectives* Communicate ideas with diverse audiences** Take Action* **KY WL Standard Language Competencies *KY WL Standard Intercultural Competencies Investigation, recognizing perspectives and taking action are directly representative of the KY Standard for WL Proficiency Intercultural Competencies. 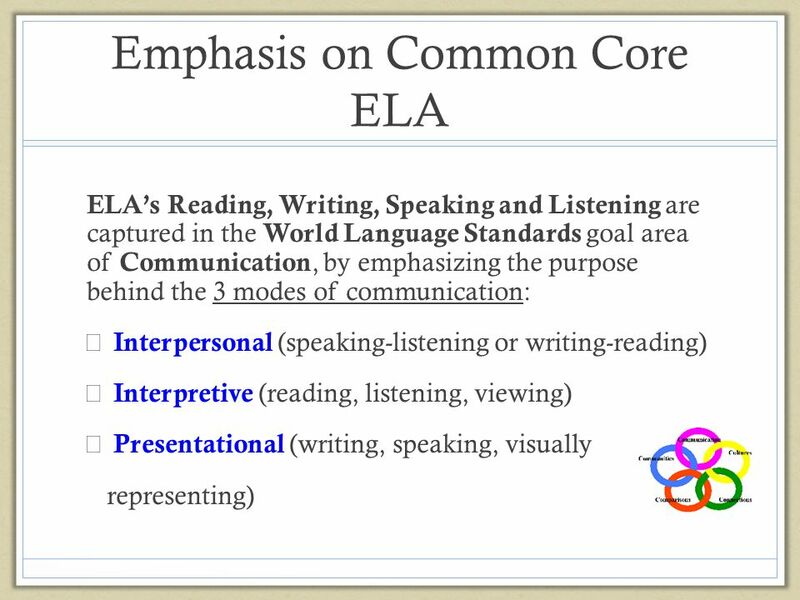 Communication is the focus of the Standard’s Language Competencies. In learning a WL students: Learn to ask and answer questions, identify words, describe people, places and things, retell stories, interpret text, and apply the conventions of language Developing mental flexibility, decoding and problem-solving skills, and increase memory function In addition, students: (Romance) Learn a new phonetic system, whole new vocabulary, extra language conventions (spelling, accent marks, pronunciation, intonation, inflection) (Asian) Learn to read by character recognition and write by following precise stoke steps to form a single character that may represent a word or phrase 3rd grade students who had received four years of language instruction in the Georgia Elementary School FL Model Program significantly outscored older students who had not had FL instruction on the Math portion of the ITBS. 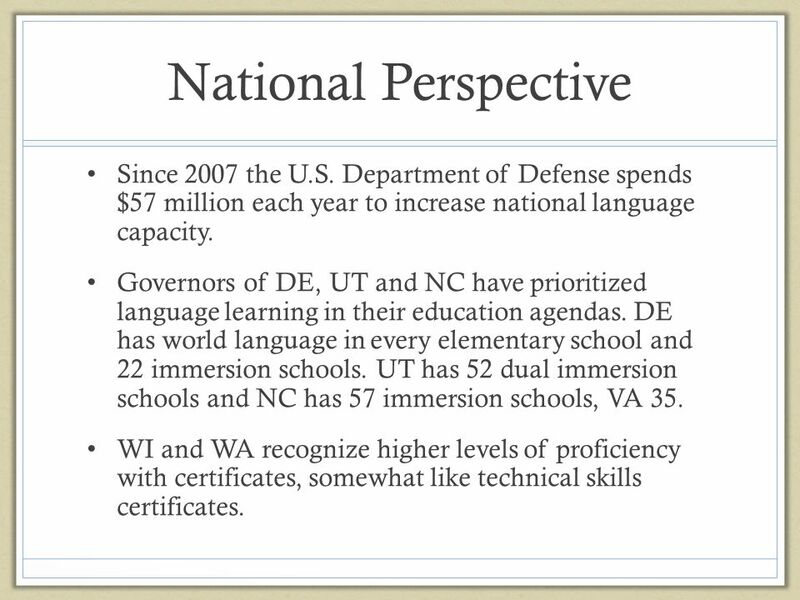 11 National Perspective Since 2007 the U.S. Department of Defense spends $57 million each year to increase national language capacity. 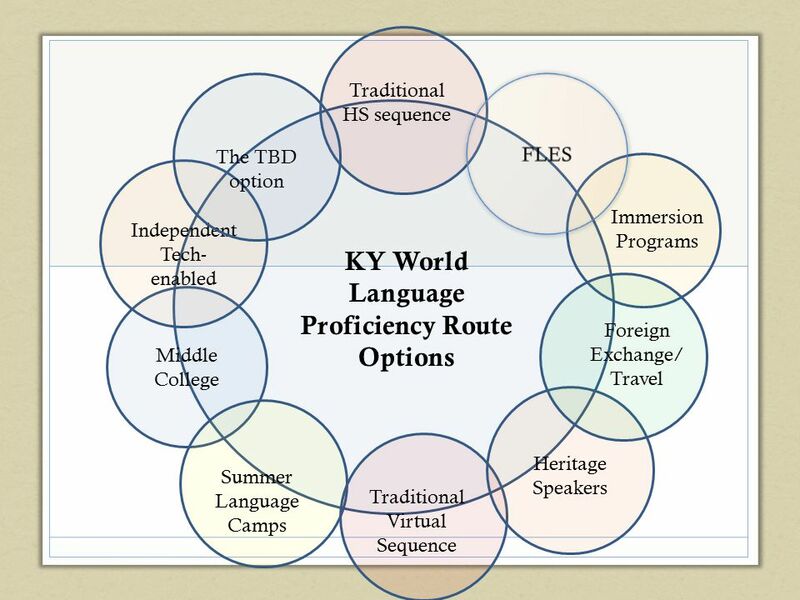 Governors of DE, UT and NC have prioritized language learning in their education agendas. 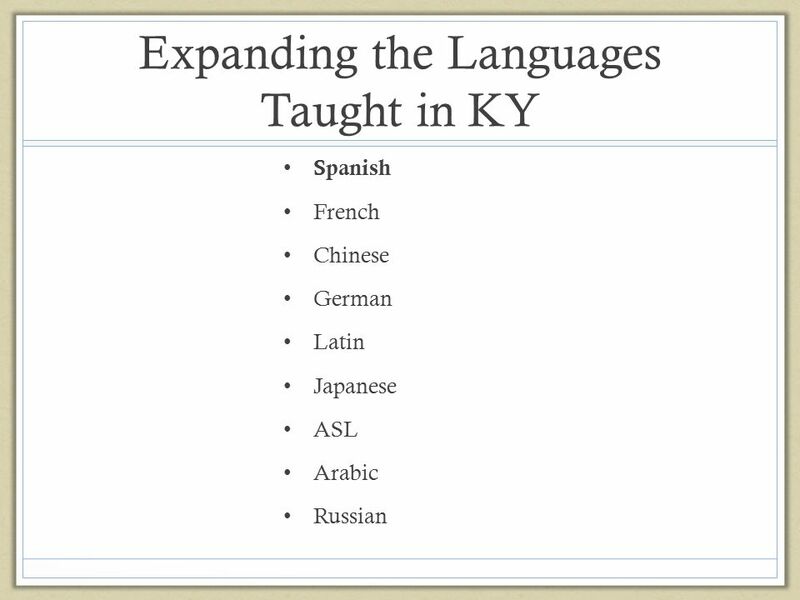 DE has world language in every elementary school and 22 immersion schools. 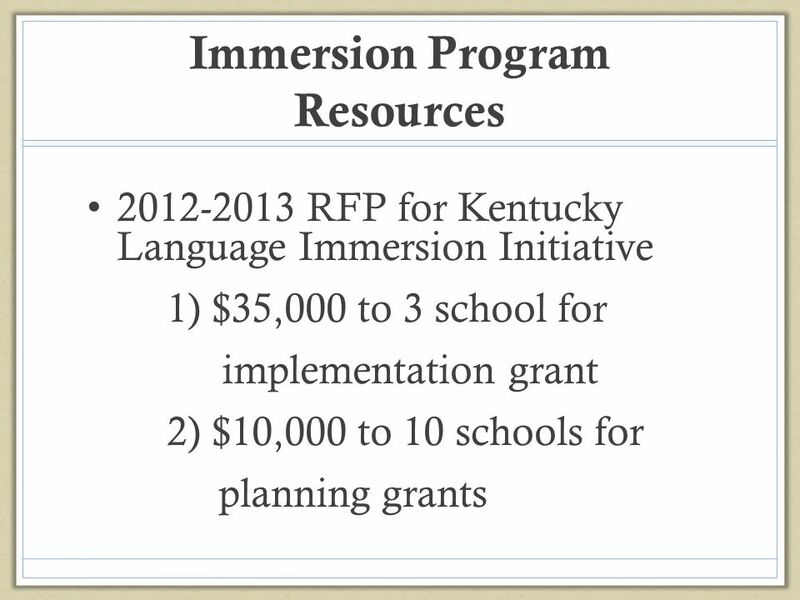 UT has 52 dual immersion schools and NC has 57 immersion schools, VA 35. 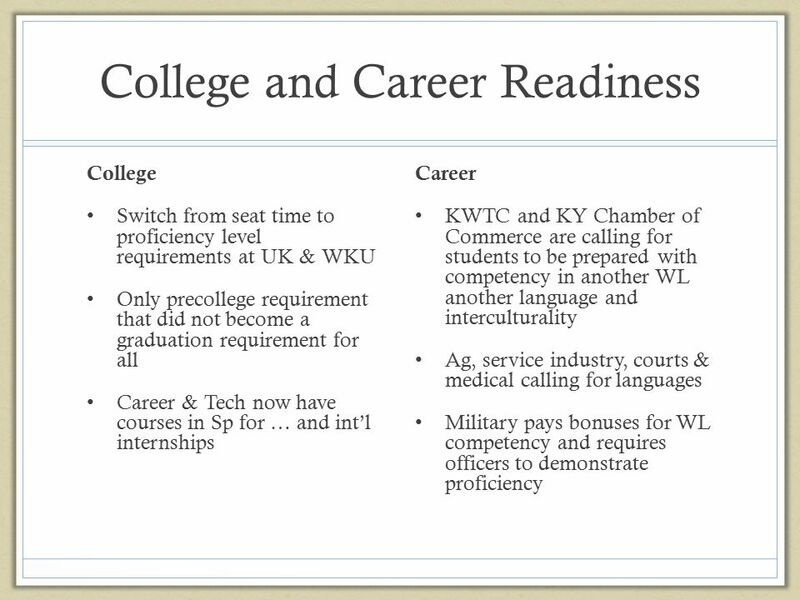 WI and WA recognize higher levels of proficiency with certificates, somewhat like technical skills certificates. 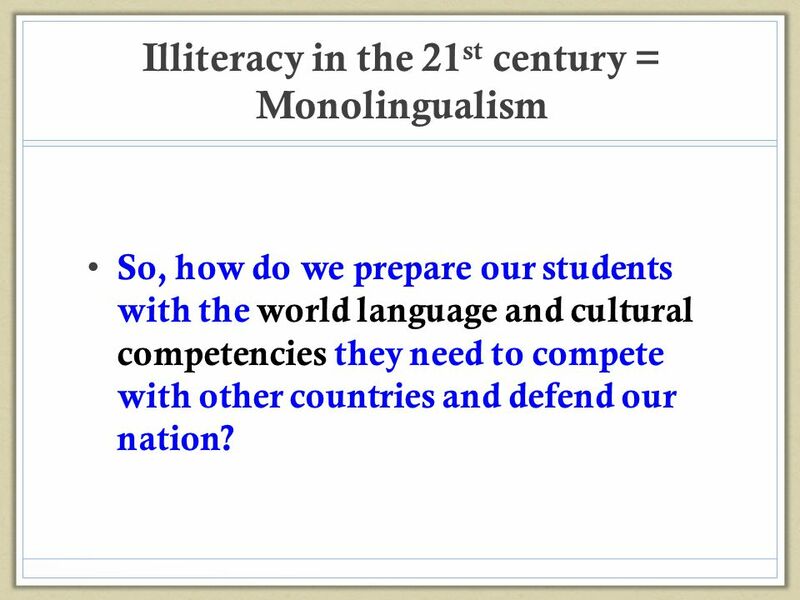 So, how do we prepare our students with the world language and cultural competencies they need to compete with other countries and defend our nation? 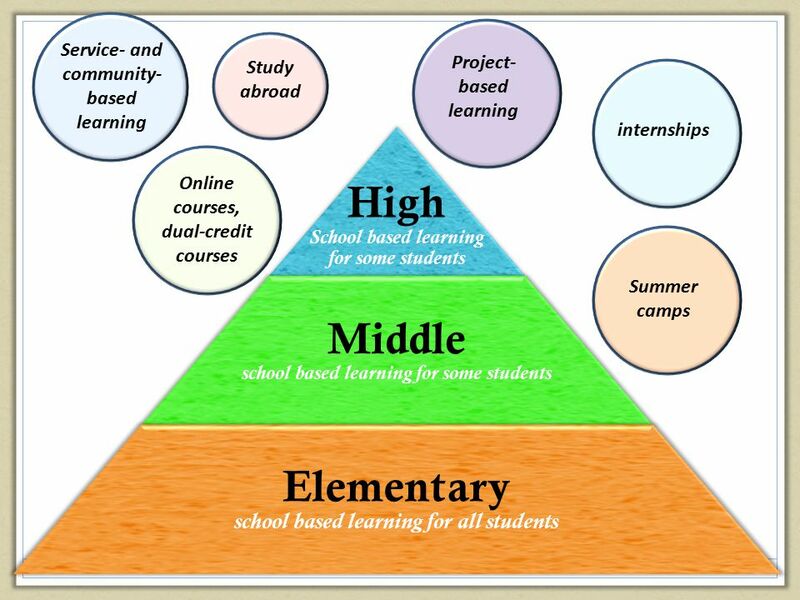 Service- and community-based learning Project-based learning Study abroad internships High School based learning for some students Middle school based learning for some students Elementary school based learning for all students Online courses, dual-credit courses Summer camps We need to flip our approach to teaching and learning world languages, so that more students have intense experiences in elementary school, where research shows learning is easier and has the greatest overall effect (cognition, literacy, pronunciation, etc.) 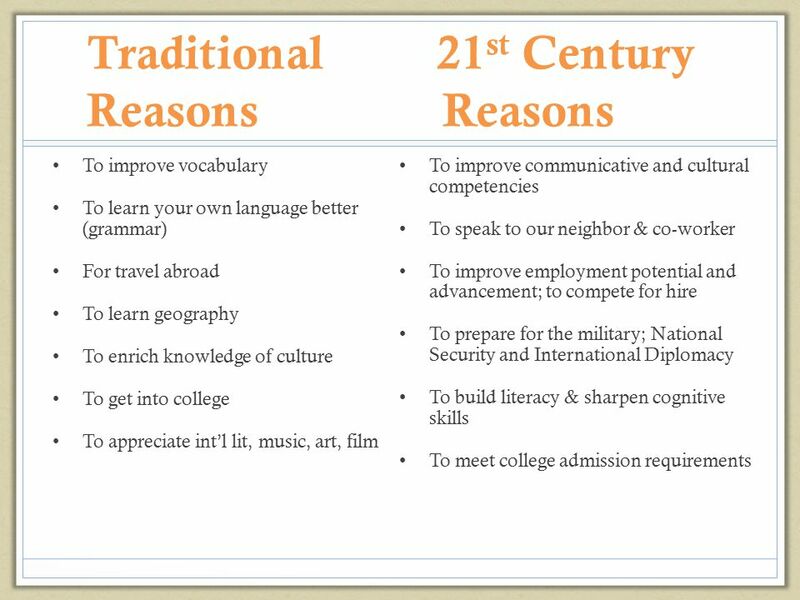 By the time they get to high school, students should be using language for collaborative int’l projects, interning in companies that need language speakers, doing community service projects in heritage communities, etc. What’s the BIG picture? 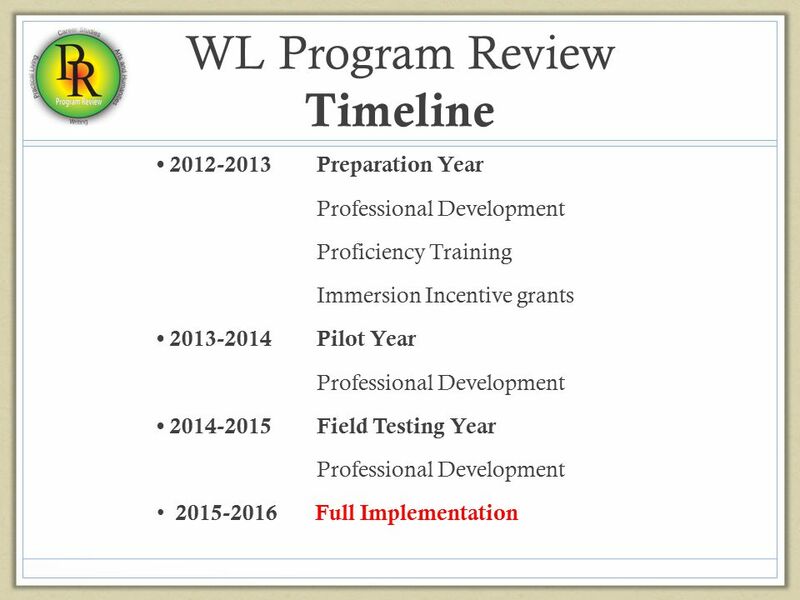 What should WL teaching/learning look like in a program? 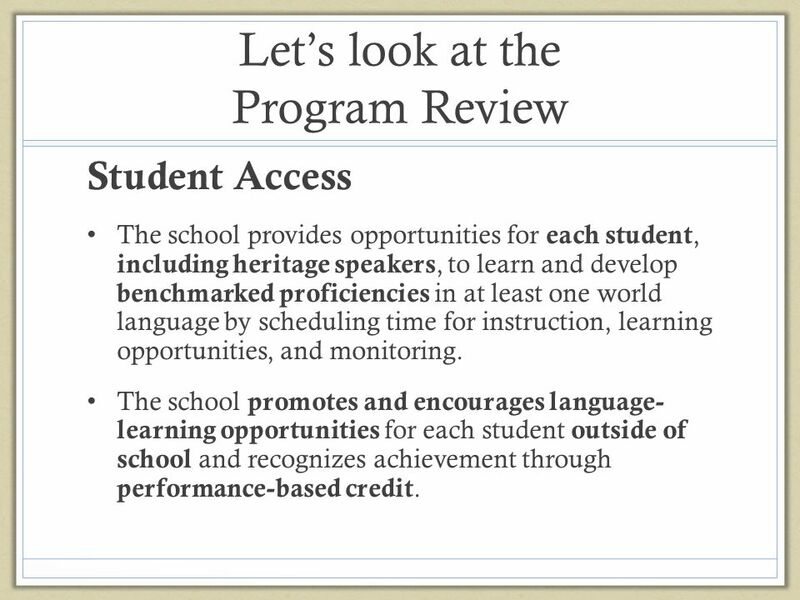 Student Access The school provides opportunities for each student, including heritage speakers, to learn and develop benchmarked proficiencies in at least one world language by scheduling time for instruction, learning opportunities, and monitoring. 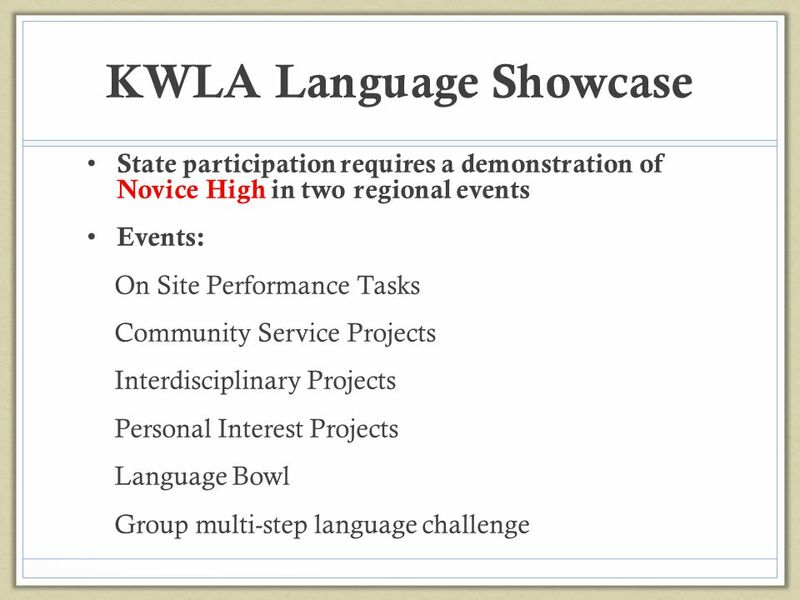 The school promotes and encourages language- learning opportunities for each student outside of school and recognizes achievement through performance-based credit. 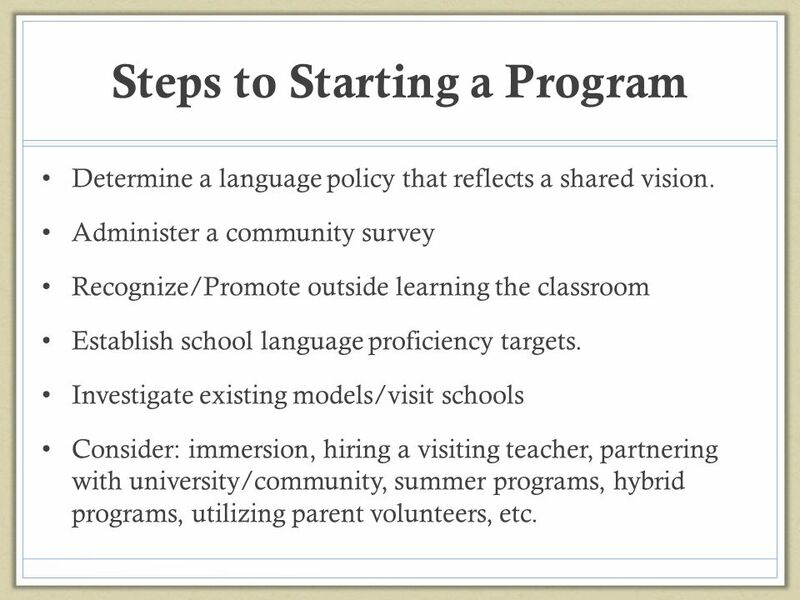 Determine a language policy that reflects a shared vision. 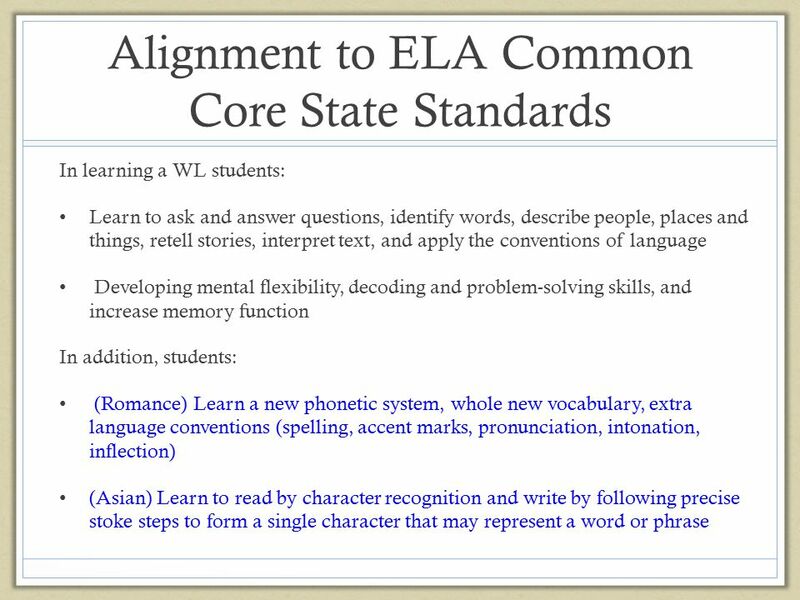 Administer a community survey Recognize/Promote outside learning the classroom Establish school language proficiency targets. 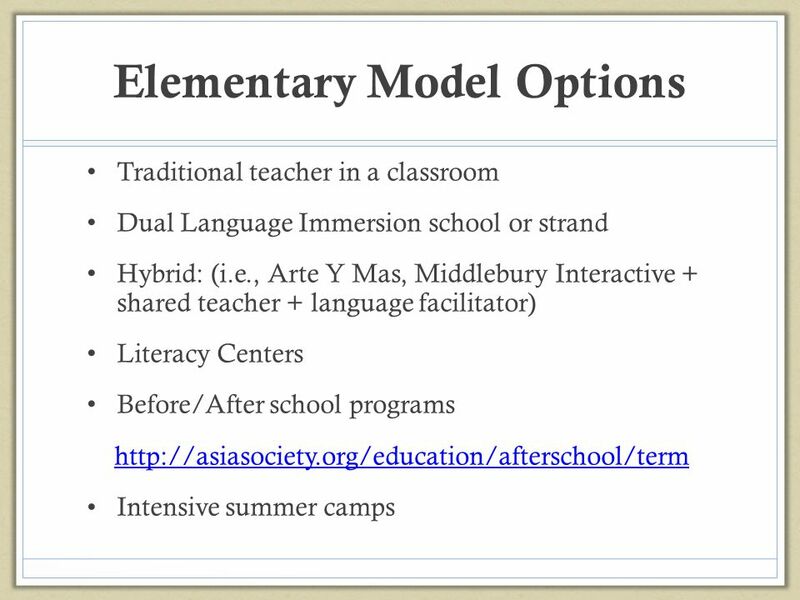 Investigate existing models/visit schools Consider: immersion, hiring a visiting teacher, partnering with university/community, summer programs, hybrid programs, utilizing parent volunteers, etc. 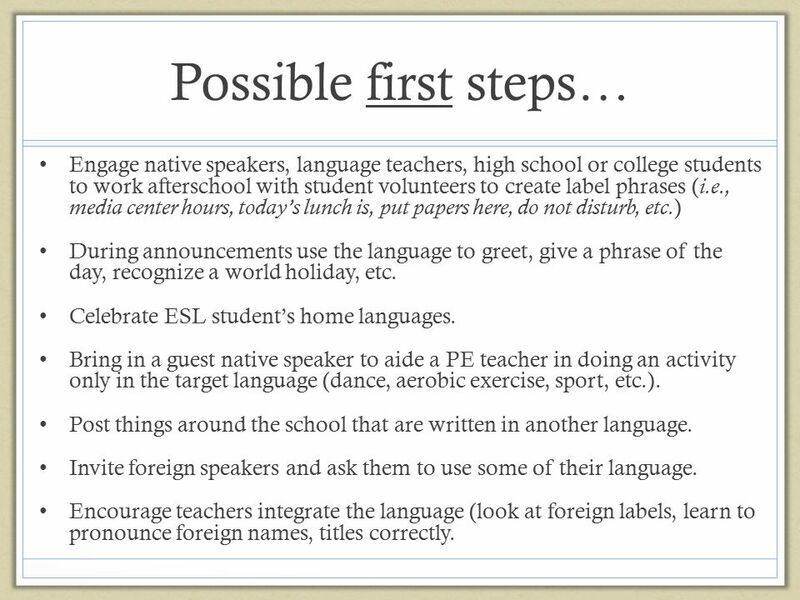 24 Possible first steps… Engage native speakers, language teachers, high school or college students to work afterschool with student volunteers to create label phrases (i.e., media center hours, today’s lunch is, put papers here, do not disturb, etc.) 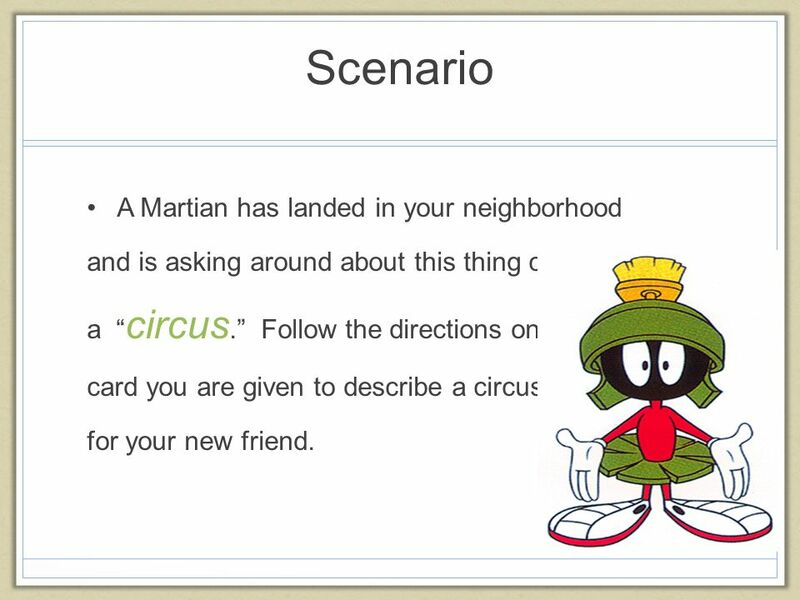 During announcements use the language to greet, give a phrase of the day, recognize a world holiday, etc. Celebrate ESL student’s home languages. Bring in a guest native speaker to aide a PE teacher in doing an activity only in the target language (dance, aerobic exercise, sport, etc.). Post things around the school that are written in another language. Invite foreign speakers and ask them to use some of their language. 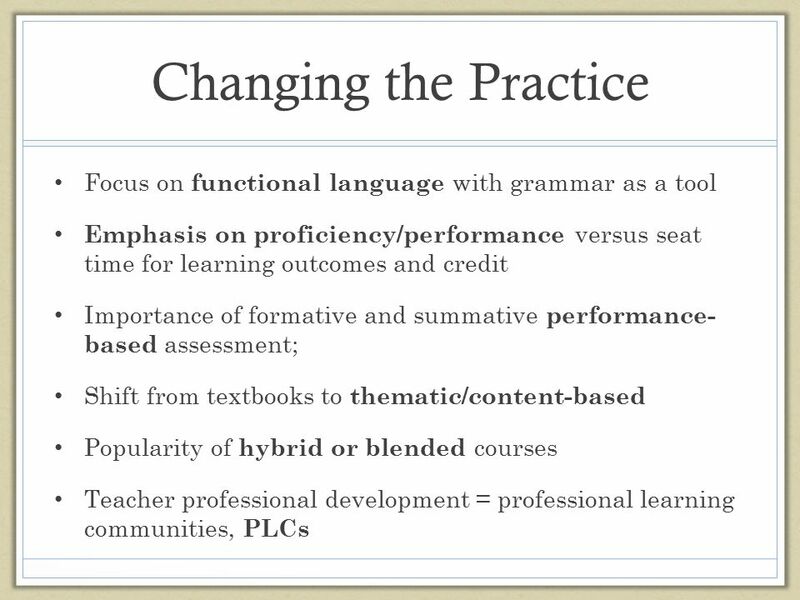 Encourage teachers integrate the language (look at foreign labels, learn to pronounce foreign names, titles correctly. 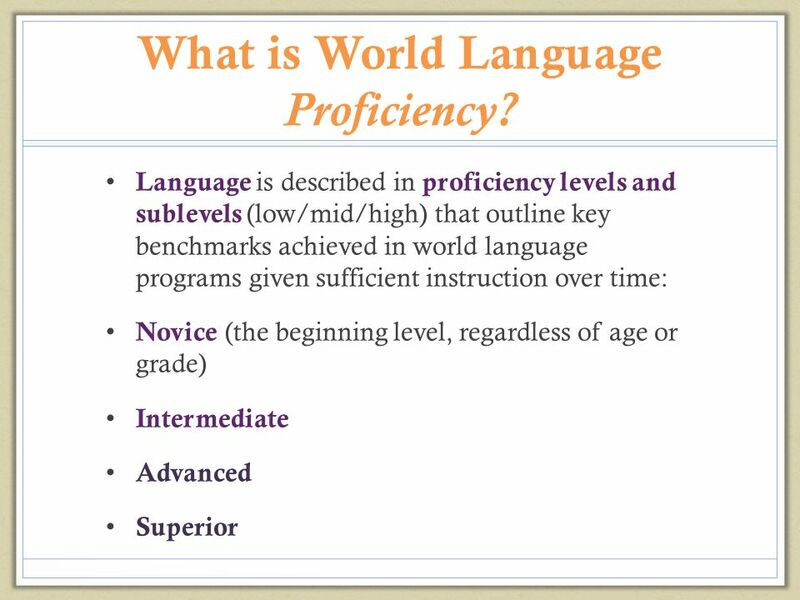 28 What is World Language Proficiency? 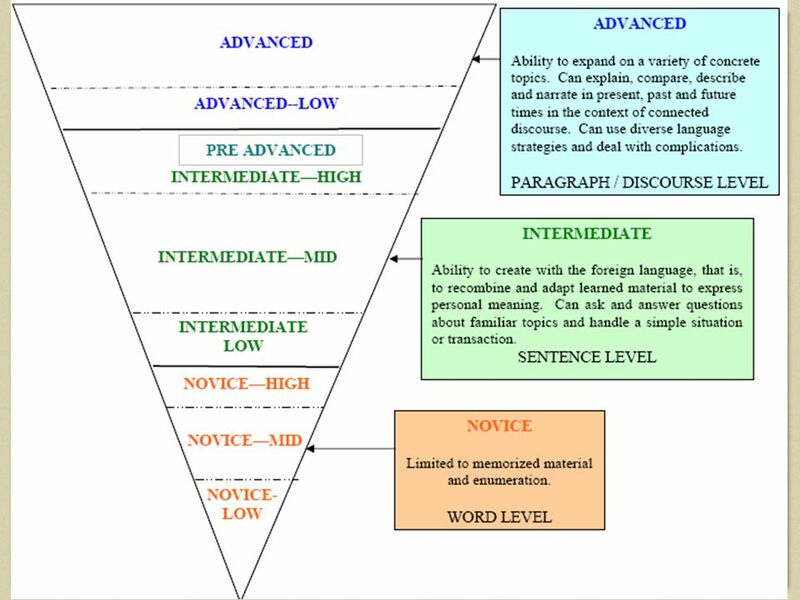 30 ACTFL Inverted Pyramid: Moving up the levels requires exponential growth (horizontally as well as vertically) The most critical factor in developing higher levels of proficiency in a second language is time. According to research, many students in K-12 systems with continuous performance-oriented sequences aligned to the standards can reach Pre-Advanced, if continuously enrolled K through 12. 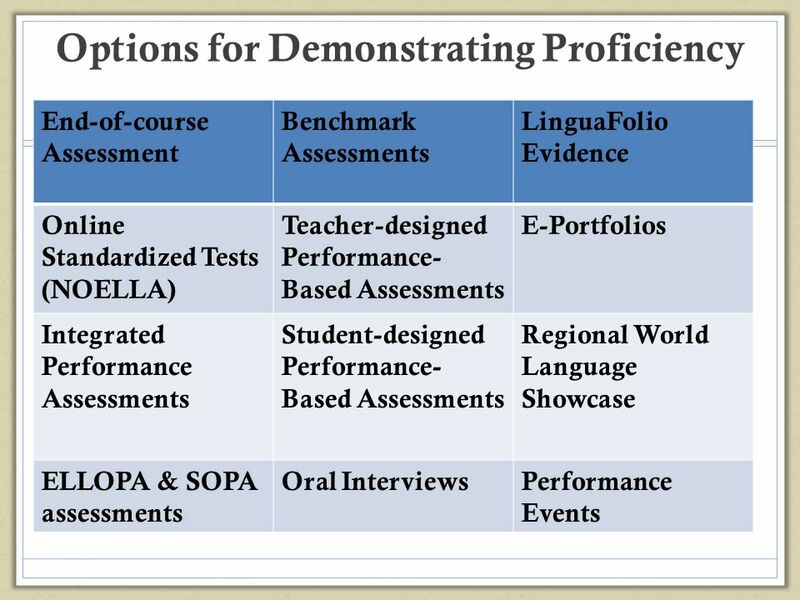 Most secondary systems (7-12 or 9-12) have Novice High as their exit proficiency goal. 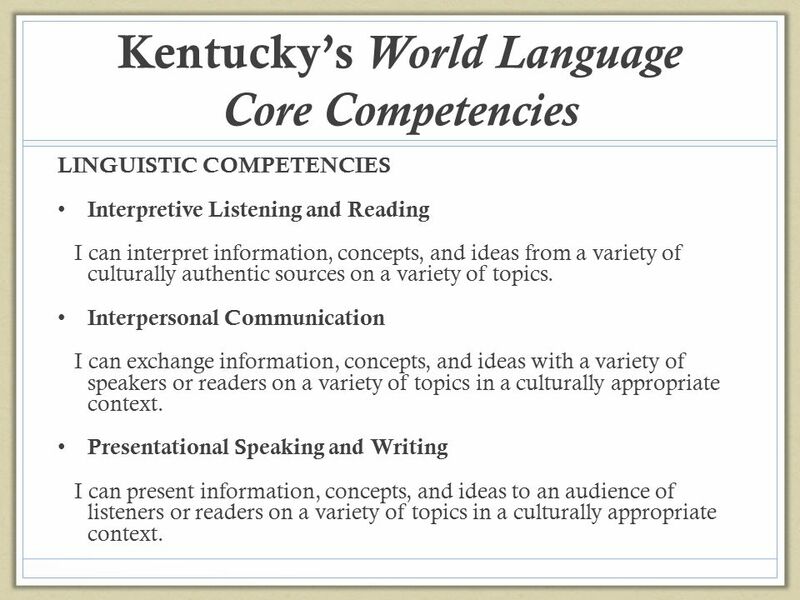 LINGUISTIC COMPETENCIES Interpretive Listening and Reading I can interpret information, concepts, and ideas from a variety of culturally authentic sources on a variety of topics. Interpersonal Communication I can exchange information, concepts, and ideas with a variety of speakers or readers on a variety of topics in a culturally appropriate context. Presentational Speaking and Writing I can present information, concepts, and ideas to an audience of listeners or readers on a variety of topics in a culturally appropriate context. 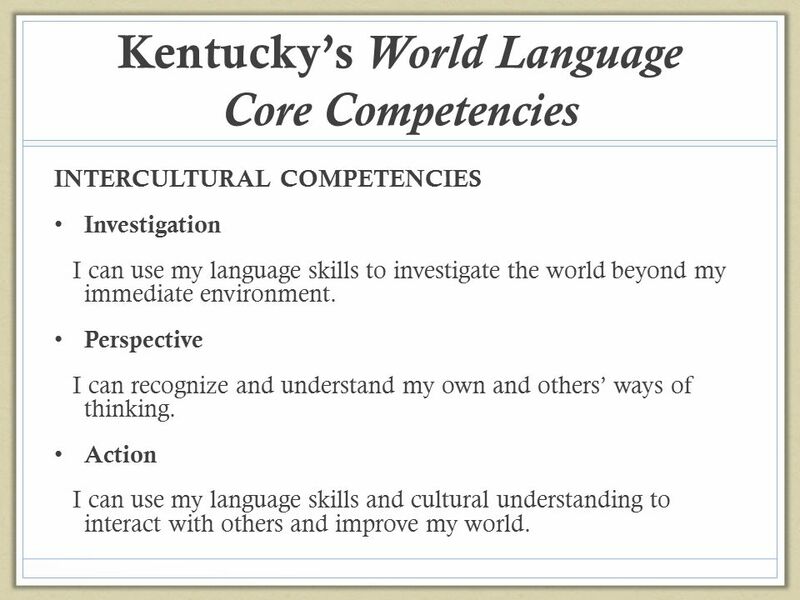 INTERCULTURAL COMPETENCIES Investigation I can use my language skills to investigate the world beyond my immediate environment. Perspective I can recognize and understand my own and others’ ways of thinking. Action I can use my language skills and cultural understanding to interact with others and improve my world. 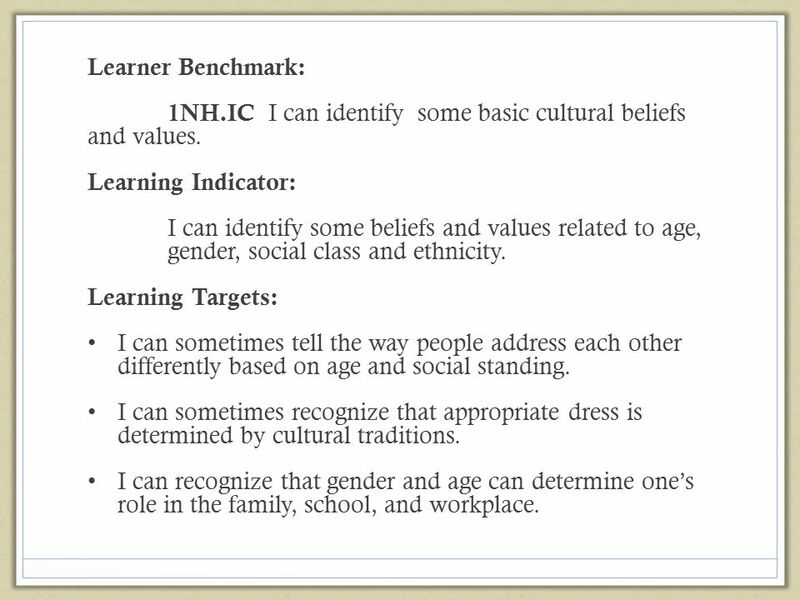 35 Learner Benchmark: 1NH.IC I can identify some basic cultural beliefs and values. Learning Indicator: I can identify some beliefs and values related to age, gender, social class and ethnicity. 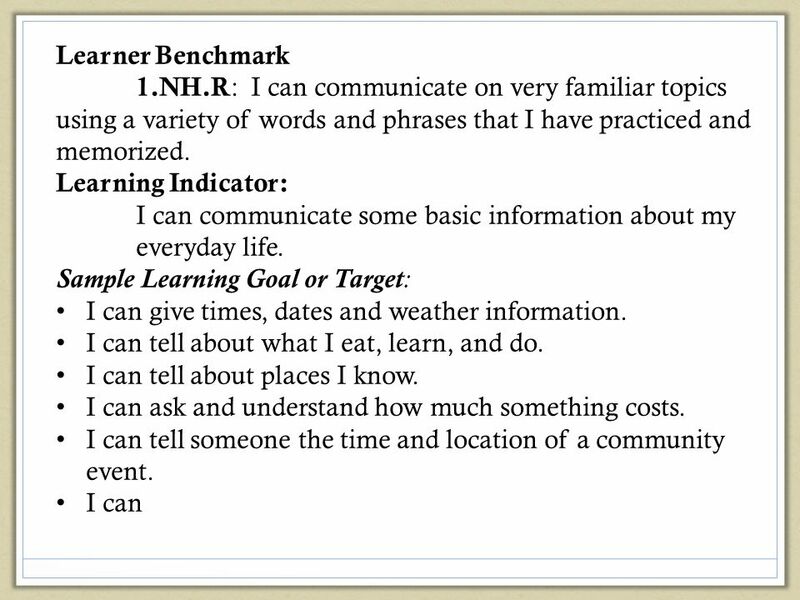 Learning Targets: I can sometimes tell the way people address each other differently based on age and social standing. I can sometimes recognize that appropriate dress is determined by cultural traditions. I can recognize that gender and age can determine one’s role in the family, school, and workplace. 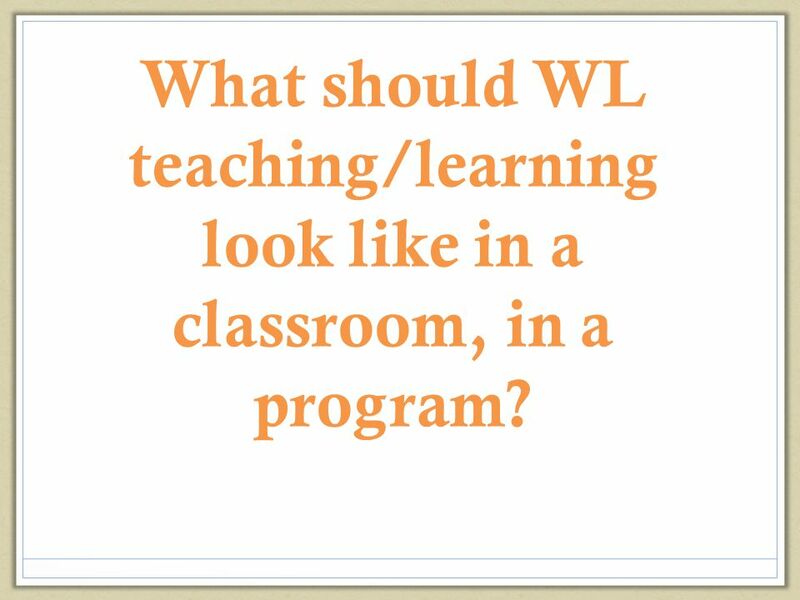 36 What should WL teaching/learning look like in a classroom, in a program? 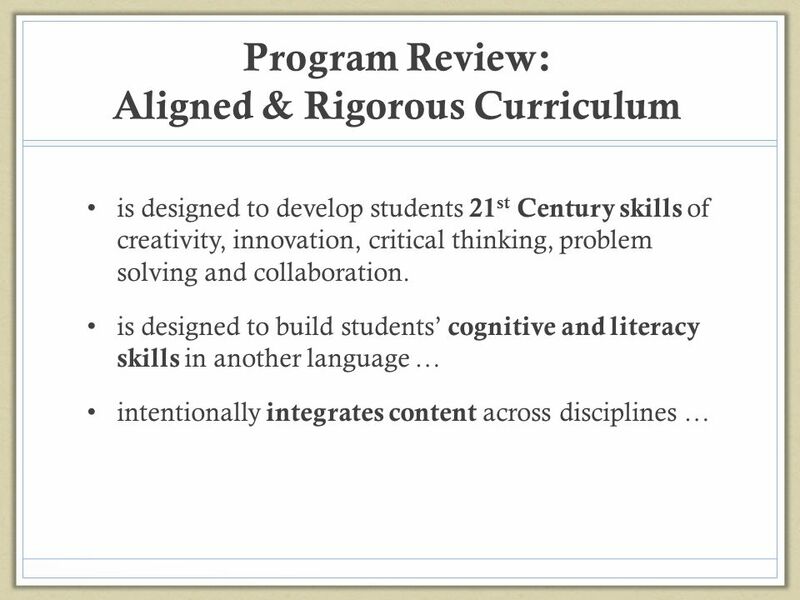 • Curriculum focused on communication building cognitive and literacy skills. 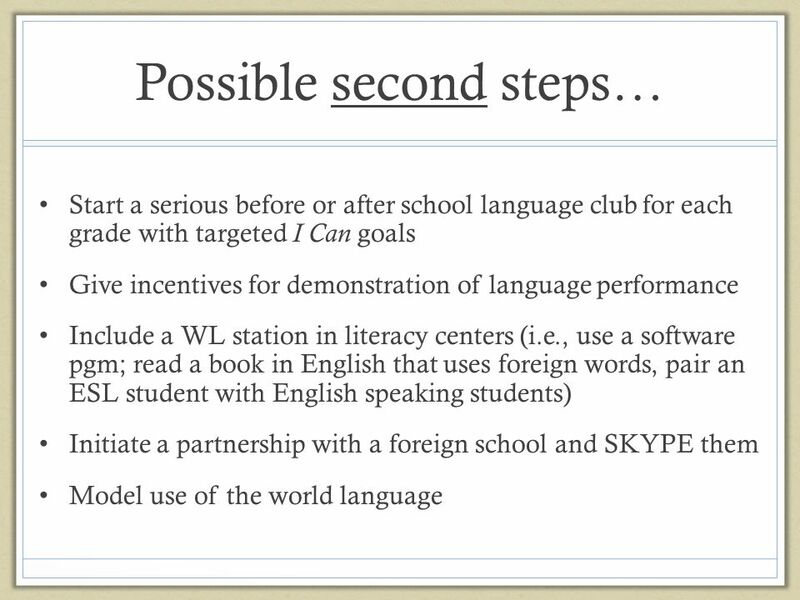 • The target language used almost all of the time and learning and is made comprehensible through a variety of strategies (i.e., visuals, body language, objects, hands-on-experiences) and technologies. 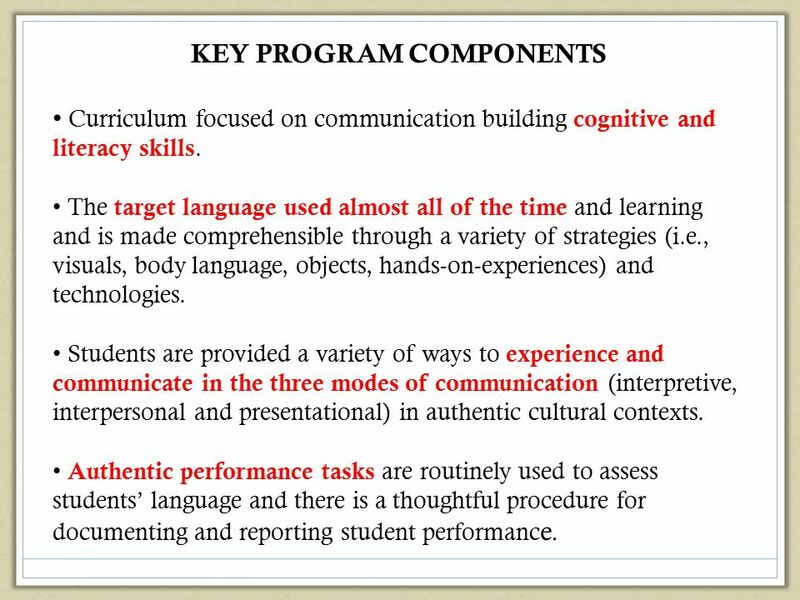 • Students are provided a variety of ways to experience and communicate in the three modes of communication (interpretive, interpersonal and presentational) in authentic cultural contexts. 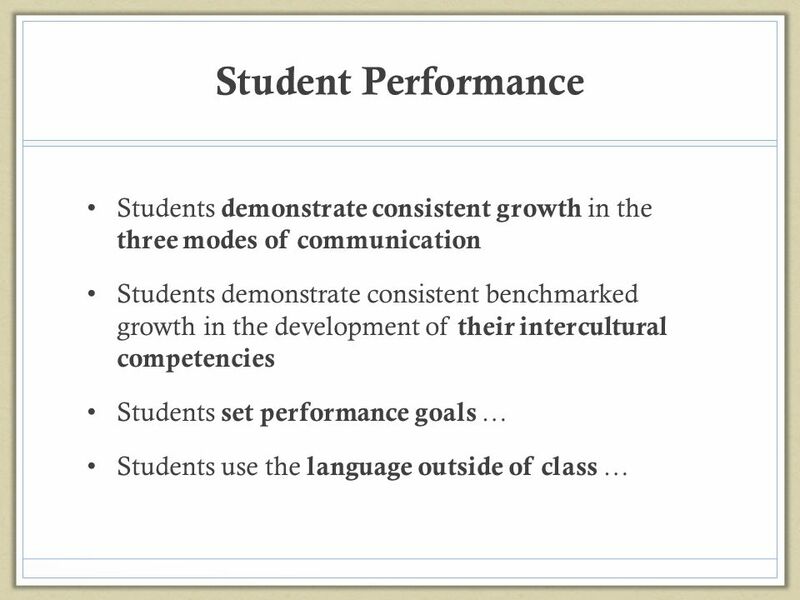 • Authentic performance tasks are routinely used to assess students’ language and there is a thoughtful procedure for documenting and reporting student performance. Learning Target: I can give information about my pet, describe it, tell where it lives, what it likes to do, what, where and when it eats. 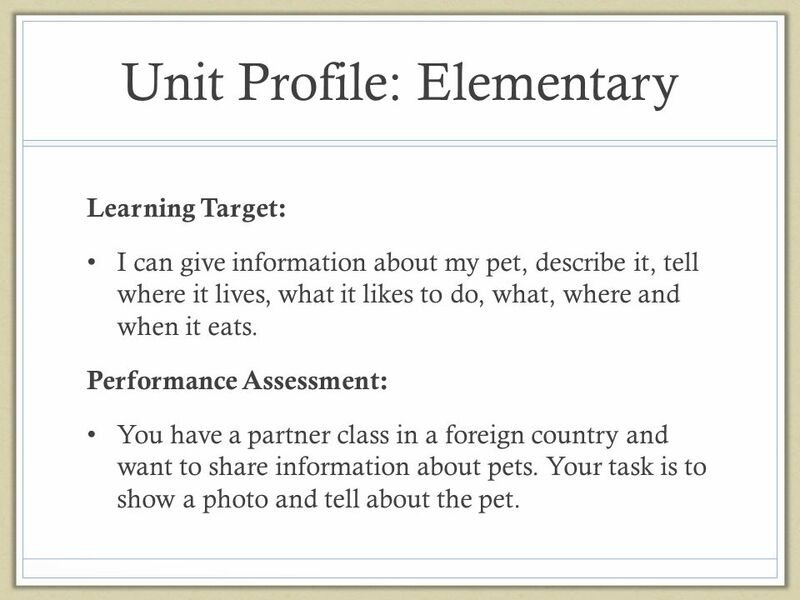 Performance Assessment: You have a partner class in a foreign country and want to share information about pets. Your task is to show a photo and tell about the pet. Counting Pennies for a Rainy Day Can you dance? How safe is your water? 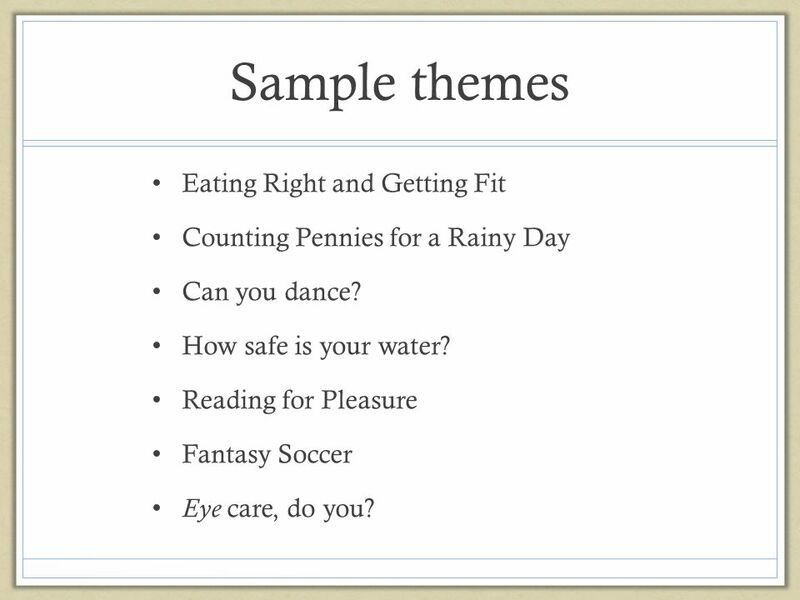 Reading for Pleasure Fantasy Soccer Eye care, do you? Note the integration of other content: Counting Pennies—economics, consumer spending, monetary units, etc. 41 What helps to learn a language? 43 What resources are there to help? 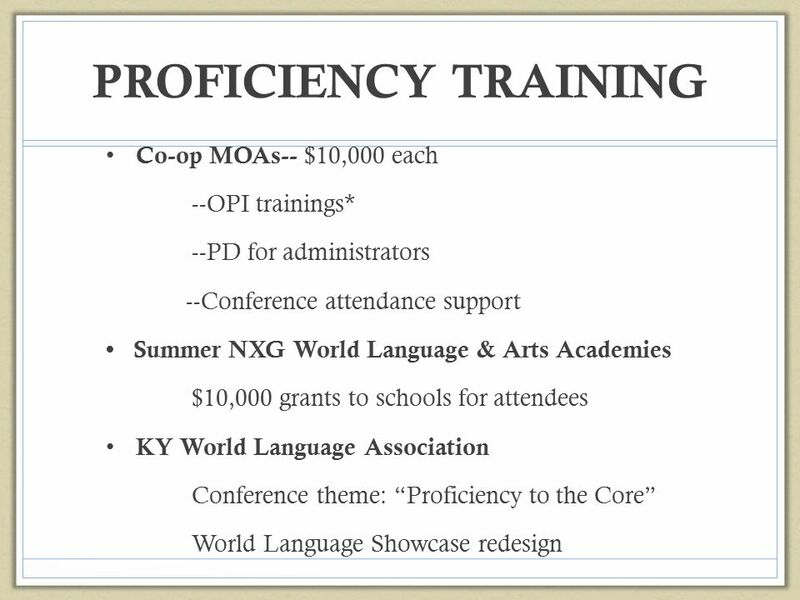 Engages learners in developmentally appropriate activities to acquire the language necessary to communicate within the novice range on the ACTFL Proficiency scale on a variety of topics, including connections to other subject areas. Cultural aspects are typically included in order to understand the relationship among the products, practices and perspectives of Spanish speaking cultures. 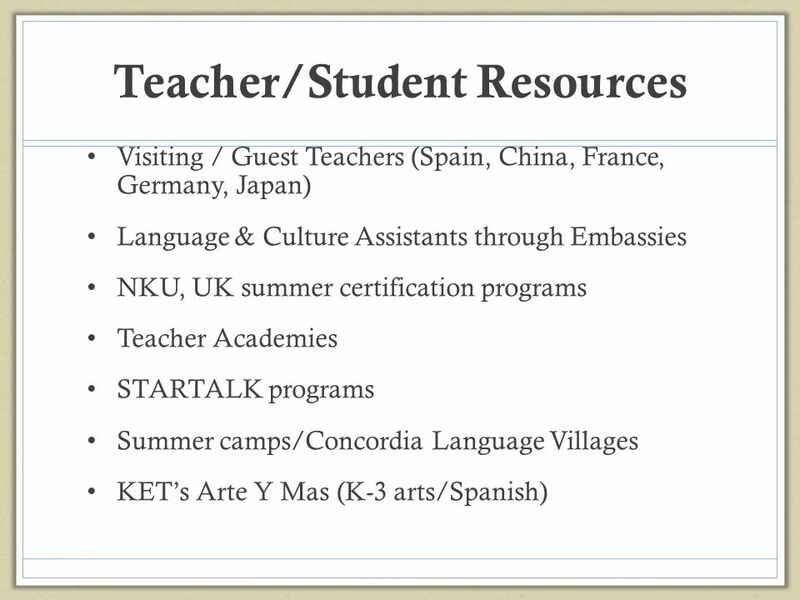 In addition, students develop insight into their own language and culture. 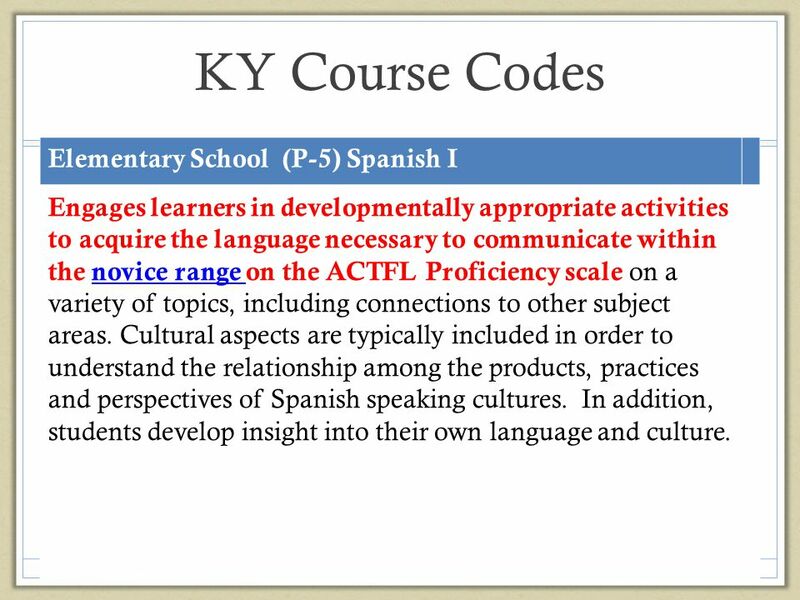 45 KY Course Codes Elementary School World Language Immersion. 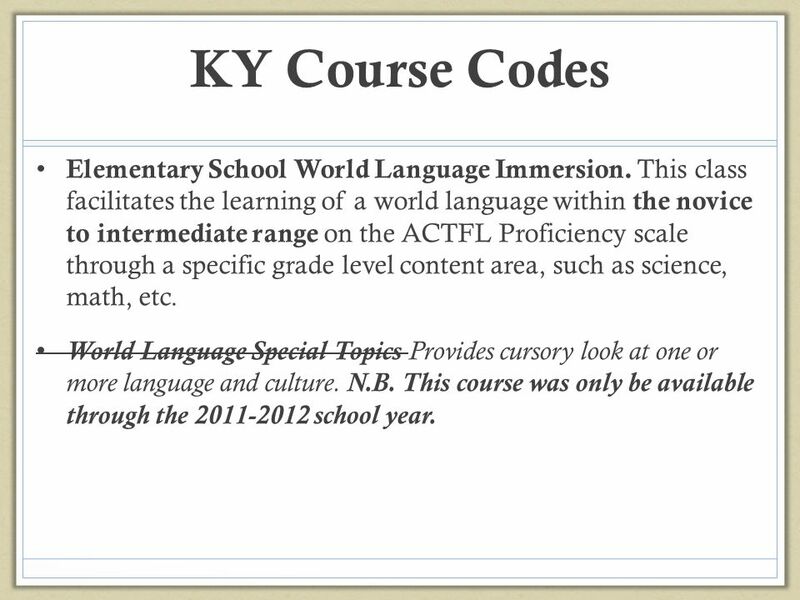 This class facilitates the learning of a world language within the novice to intermediate range on the ACTFL Proficiency scale through a specific grade level content area, such as science, math, etc. 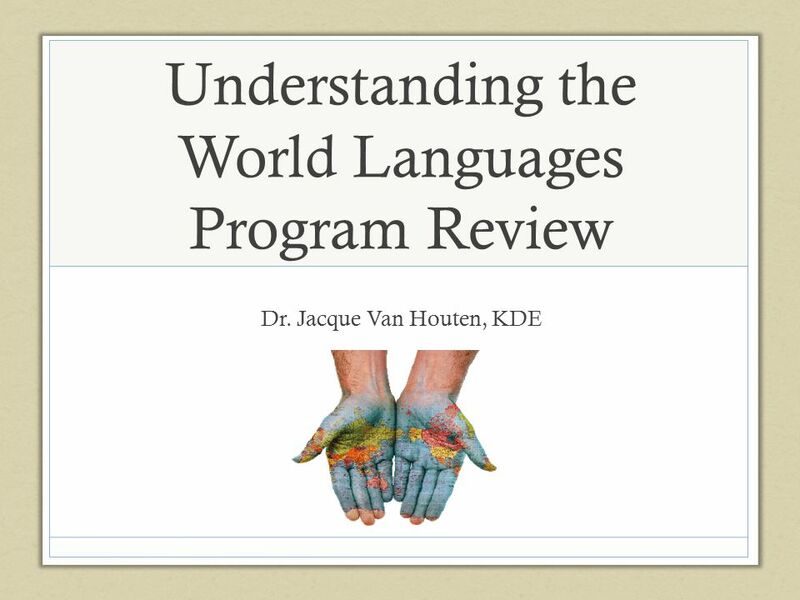 World Language Special Topics Provides cursory look at one or more language and culture. N.B. This course was only be available through the school year. 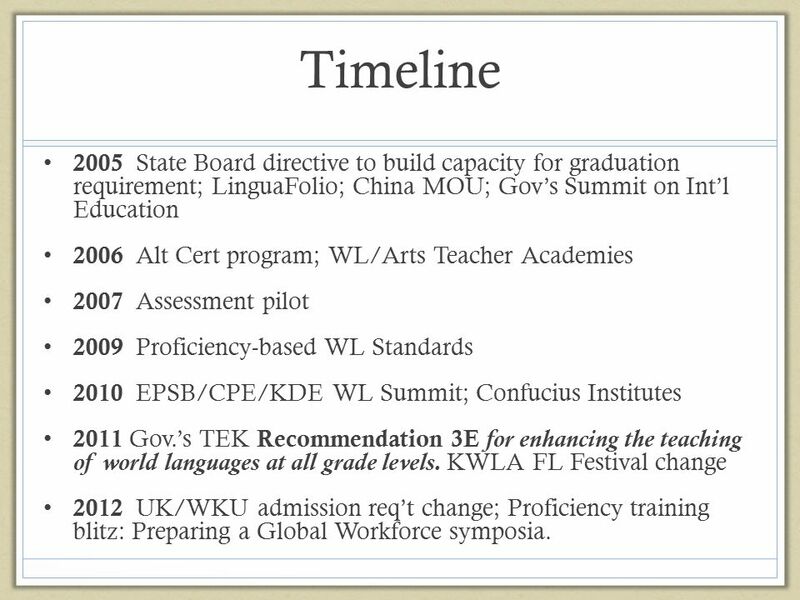 Download ppt "Understanding the World Languages Program Review"
Michigan World Language Graduation Requirements & Assessments. Can you imagine? 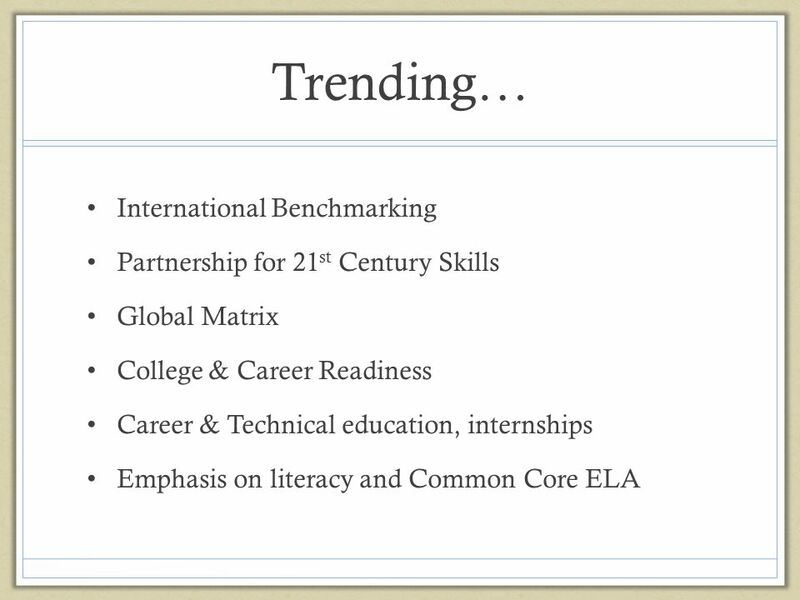 What would it take for us to prepare our students for the world they will soon be running? Administrator Session Proficiency or Seat Time? University Admission Requirement. 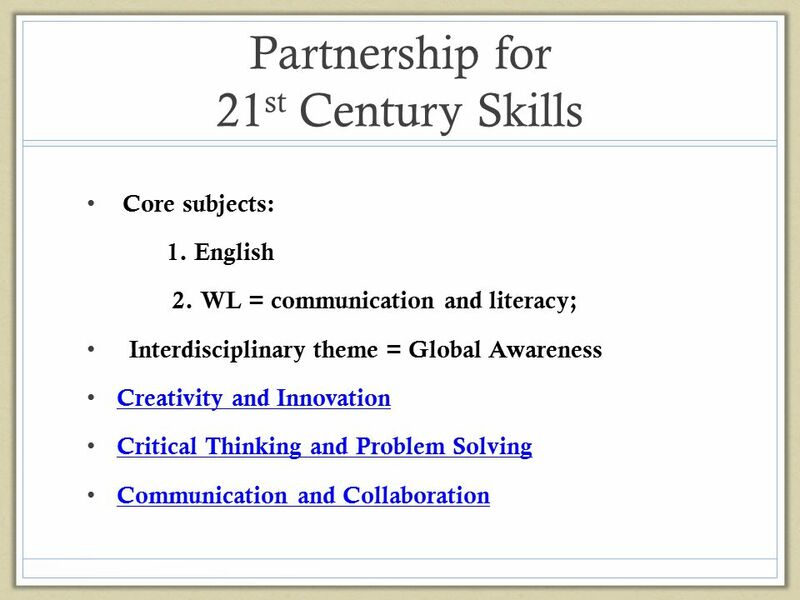 College, Career, Civic and Globally Competent? Kelly Clark KDE, Lead consultant: Global Competency By PresenterMedia.comPresenterMedia.com. 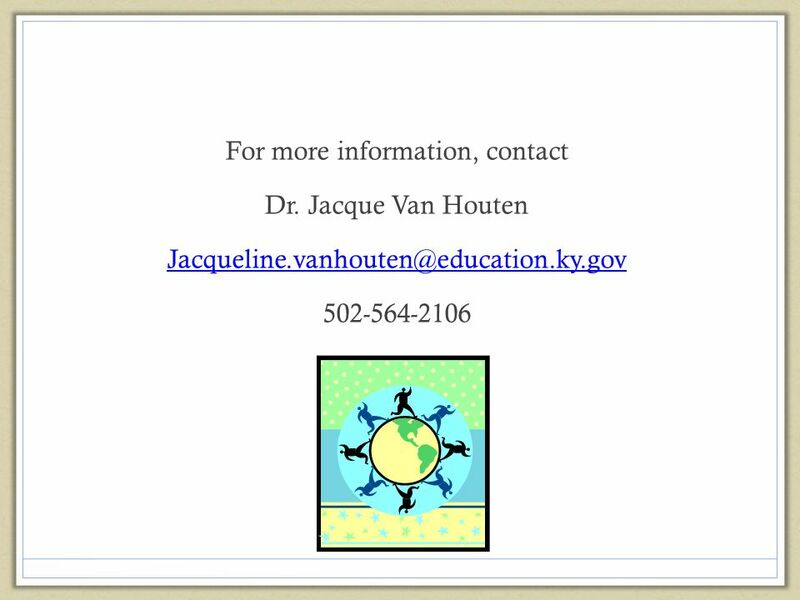 World Languages Advisory Committee January 20, 2010.